Protect your confidential and valuable information from being stolen by shredding any documents that may put your business at risk from identity fraud. 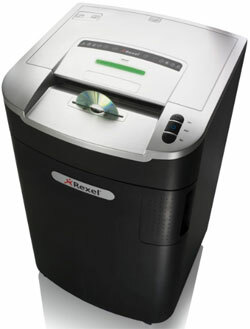 The Rexel Mercury RLM11 large office shredder is perfect for a busy office of 20 or more users and has the high S4 security level which means that it shreds paper into unreadable, super small micro-cut confetti style particles (sized 1.9 x 15mm) making it ideal for highly sensitive data. Paper jams in a shredder are time consuming, frustrating, messy and can be costly if you have to call out an engineer. With the RLM11 shredder, paper jams are a thing of the past. Featuring the revolutionary Mercury Jam Free technology, the RLM11 has a unique brightly lit LED indicator that warns you whether you are trying to feed too much paper into the shredder in one go. The illuminated red light means you should stop and remove some sheets of paper and illuminated green light means that there is no risk of jamming. The RLM11 is a super quiet, high security shredder that can shred up to 12 sheets of 70gsm paper in a continuous single feed as well as CD's, credit cards, paperclips and staples. Specifically designed for large volume shredding, it features a huge 115 litre large capacity pull out frame with plastic or paper bags that hNEWs up to 1250 sheets of 70gsm paper meaning you rarely have to empty it. The front opening door and pull out frame is designed to enable simple and mess free emptying and the shredder cuts off automatically when the bag is full signalling that it needs emptying. The RLM11 goes into power saving mode after 2 minutes of non use, making it an ideal choice for the environmentally friendly office. With a clear, easy to use LED control panel, castors for easy manoeuvring around the office and an Auto Oiling System, the stylish RLM11 is the ultimate choice for a busy office environment that requires high security shredding.